Summer is upon us, which means only one thing in Wisconsin... Beer! 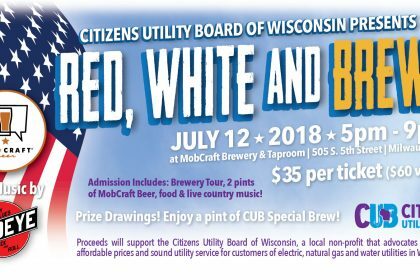 Join CUB at MobCraft for an evening of food, live music, and of course, tasty MobCraft brews. Discounted presale price through July 5. Get your tickets today! Join us in celebrating CUB’s 40th Anniversary at Lakefront Brewery for an evening of food, networking, and tasty Lakefront brews. Outpost Natural Foods and the Citizens Utility Board of Wisconsin (CUB) invite you to attend a 30 minute talk by CUB’s Executive Director Thomas Content. You are also invited to bring your utility bill and schedule a time at the utility bill clinic.